The DC surge protector is connected to the DC cabling of SolarEdge three-phase inverters. The DC surge protector reduces faults in inverters and DC optimisers caused by electrical surges on the DC cabling of the solar system. The DC surge protector is not designed to protect against a direct lightning strike, but rather large electrical surges resulting from lightning strikes occurring within the vicinity. The DC surge protector is designed to divert electrical surges to ground when a surge is detected on the circuit. The cartridge has the ability to divert multiple surges before it requires replacement. It has a visual status indicating when it needs to be changed. 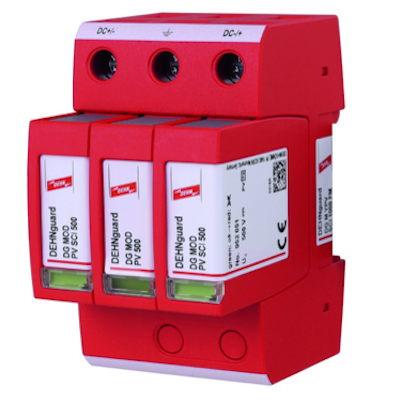 The DC surge protector is designed for DIN rail mounting and installed outside of the inverter. The device can be mounted indoors or outdoors using an appropriately rated enclosure.